Time to come clean, we already know quite a bit about this image, but it follows earlier discussions. And not all of you may know the image. By now you all know level of detail we want. The clue here is that church tower on the hill, top left, familiar from many photos at Buxton. This one was taken from the slope on the north-west side of Buxton LNWR station, looking east-north-east over the site of the old engine shed in the foreground. The three tracks above the 2-6-4T lead to the right to the station buffers. Date? Suggest c1950. So why would anyone leave three coal trucks next to an old corrugated tin hut? The nearest truck looks like it has been partly unloaded. There was also certainly a carriage-heating boiler at Buxton, because I have talked to the men who used to fire it and I also remember it working. It was not removed until work was due to start on the new diesel depot in 1956. It was situated on one of the two roads on the site of the old LNWR shed. A corrugated structure was built round it to provide some sort of shelter. The boiler itself was an old 17in Coal Engine boiler and worked at a boiler pressure of 60lb psi. It was an absolute nightmare to fire as its injector was an original LNWR type and was very temperamental. The fuel was a mixture of wood, scrap brought from Derby carriage works, and coal, and though the working pressure seems low it was very hard to maintain. Not only did it supply heat to 15-20 carriages but the pipe itself was so old that it had a number of small holes through which steam escaped. It must originally have supplied only the LNWR side of the station but at some time, probably in the 1920s and certainly by the late 1940s, it also supplied the Midland side. The pipe from it passed under the railway and the road to reach the Midland side. Steam escaping from the pipe rose through the road! The idea was to heat the carriages so that the train engine only needed to hook on and take them off to the station or wherever the train was to start from. When the system was abandoned about 1956, the train engine had to hook on an hour before departure. The weather was much worse in those days (whatever might be believed about global warming) and without the carriage-heating system the windows in the carriages would often have been frozen up inside and out. The system came into use every year on 1st October. A similar boiler was in use at Middleton for the winding engine. I was intrigued by the photo because I work for the railway at Buxton and after asking some old hands at the depot we are sure that it is Buxton. 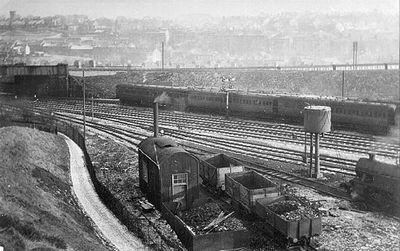 Where the trucks are in the foreground is where the engine shed is now (built about 1959), and where the carriages are in the background is roughly where Buxton Water is and on the other side to them was a goods yard/engine shed with the unusual nick name of 'Jerusalem' where Aldi is now situated. I hope that this is of some use to you. As to why the coal trucks are half empty - sorry no idea!